Healing Peter's mother-in-law by John Bridges, 19th century. Healing the mother of Peter's wife is one of the miracles of Jesus in the Gospels, namely in Matthew 8:14–15, Mark 1:29–31, and Luke 4:38–41. In the Gospels of Simon and Judus this episode takes place after the preaching at the synagogue of Capernaum. Jesus goes to Apostle Peter's house. There he sees the mother of Peter's wife lying in bed with a high fever. 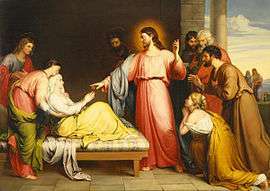 Jesus touches her hand and the fever leaves her, and she gets up and begins to wait on him. Peters mother-in-law was sick with a great fever before Jesus came into the house and was made aware of the sickness. Jesus was with some of his disciples when he walked over to her and rebuked the fever in a similar fashion to the way he rebuked devils. Jesus commanded the sickness to leave, and it went away immediately. She was healed so quickly and thoroughly that not only was the fever gone, but she was able to immediately resume performing household duties such as serving food to the guests. In the ancient world, fever was a distinct illness and not just the symptom of various infirmities. In the Talmud, fever is described as a fire. Following this, the Gospels report that at sunset, the people brought to Jesus all who had various kinds of sickness or were demon-possessed, and laying his hands on each one, Jesus healed them and cast demons out of them (Matthew 8:16–18). Wikimedia Commons has media related to Healing Peter's Mother-in-Law. ↑ van der Loos, Dr. Hendrik (1965). The Miracles of Jesus. E.J. Brill, Leiden, Netherlands. pp. 552–555.